This chapter examines the challenges to 21st century content preparation and pedagogy from the perspective of teaching professionals from different African countries: Cameroon, Ghana, South Africa, Lesotho and Zimbabwe. 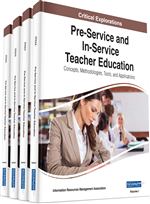 Specifically, the chapter explores the views and experiences of the participants during and after teacher preparation programs. Findings reveal common challenges, specific 21st century skills that are overlooked, and those not yet fully integrated in teacher preparation programs. The chapter offers suggestions for improvement based on the views of participants, research-based literature review, and best practices in teacher preparation programs. The last quarter of the 20th and early 21st century has witnessed increased migrations throughout the world. The United States of America, Europe, Brazil, Canada, South Korea, and South Africa, for example, have experienced exponential increases in numbers of new migrants. Migration has necessitated the need for multicultural and global skills as both teachers and students relocate to new geographical locations. There has been an increase of teachers from African countries emigrating to teach in Europe, USA, Brail, South Korea and other parts of the globe. There also has been an increase of teaching professionals from Asian countries such as Philippines, India, Singapore and China emigrating to teach in the USA and other parts of the globe. Globalization and 21st century skills’ requirements are dictating the need for teachers to acquire and implement appropriate capabilities in teacher preparation and professional development programs. Globalization has been defined as “the intensification of worldwide social relations which link distant localities in such a way that local happenings are shaped by events occurring many miles away and vise versa”, (Burbules & Torres, 2000, p. 29). Similarly, Lechner (2001) described globalization as the expansion of global linkages, the organization of social life on a global scale and the growth of a global consciousness, hence to the consolidation of world society. Education plays a significant role in promoting and enhancing globalization. It inculcates skills that are necessary for global understanding and functionality; a global commons. A lack of globalization skills and education brings with it challenges such as xenophobia, cultural imperialism, hegemony, and dysfunctional classrooms with social behavior challenges (see Figure 1, visual summary of the challenges). This has been witnessed in South Africa, and some parts of Europe and the USA. Research-based evidence supports the need for 21st century skills that enable individuals to function in a global society. The vehicle by which such skills could be achieved is through education. However, it is necessary that teachers first acquire the appropriate skills before meaningful change can occur, since teachers are the transmitters of change through educating the population. Content preparation in teacher education programs therefore needs to infuse 21st century skills and pedagogy that facilitate a change in attitudes, knowledge and skills. This chapter employs qualitative methods to explore appropriate 21 century skills that need to be integrated in teacher preparation programs in Africa in order to strengthen the “next-generation teacher.” Necessary 21st century globalization skills include: communication skills, technological literacy and fluency, negotiations skills, knowledge on geography, cultural and social competency, and multiculturalism and bi-multi lingualism.